The difference plot may sometimes suggest a relationship between the differences and magnitude of measurement. Often, the band of points on the difference plot will start narrow and then widen to the right of the plot as magnitude increases. This indicates that the variability of the differences increases with magnitude of measurement. Sometimes, the band of points may not be horizontal, which indicates a relationship between average difference and the magnitude. To illustrate these concepts, we will use an example from Bland & Altman’s 1999 paper. 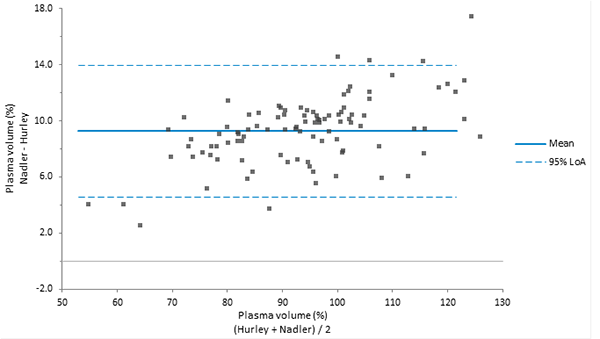 This example measures plasma volume expressed as a percentage of normal using two alternative sets of normal values from Nadler and Hurley. In the Model drop-down list, click Matched Pairs to indicate the layout of the data. In the Y variable drop-down list, select Plasma volume. In the Item variable drop-down list, select Subject. In the Method variable drop-down list, select Method. The difference plot shows an obvious systematic difference between the methods as all the differences are above the line of equality (zero). There is also a clear relationship between the difference and the mean, with the difference increasing as plasma volume rises. The limits of agreement appear rather wide at low values and too narrow at higher values.